Got out this evening just before sunset and ran into this beautiful immature female Snowy Owl. 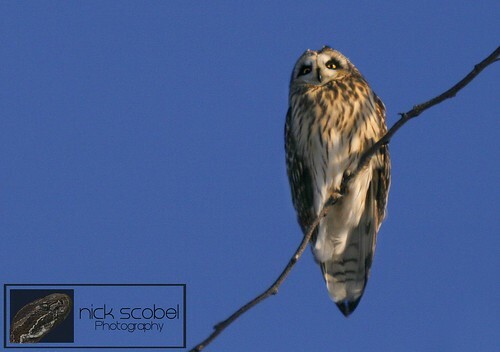 The lighting was perfect and the owl was more than obliging for a short photo shoot. Temperatures were downright freezing today with highs only reaching the high single digits. Though it was cold we did get to see the sun a bit today, which is a fairly uncommon thing during Michigan winters. 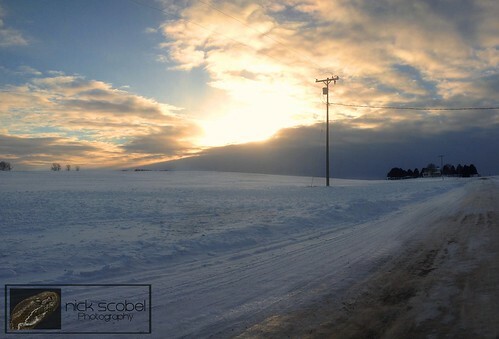 I decided to take a drive in the last hour of daylight to the agricultural lands of Isabella County to see if any snowy owls were to be found. With this being a probable record breaking irruption year, owls have been all over open areas like this. 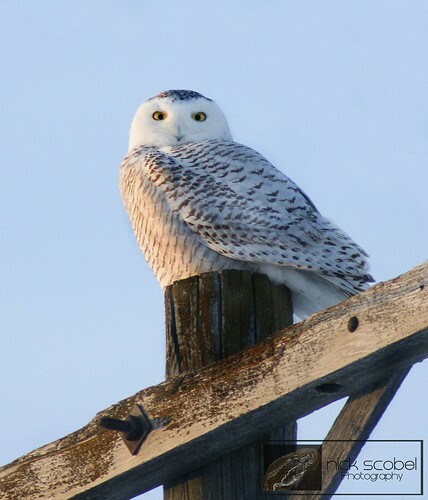 While driving the area through the area I was particularly attentive to power poles, fence lines, and hay bails as these are favorite perching spots for snowies. 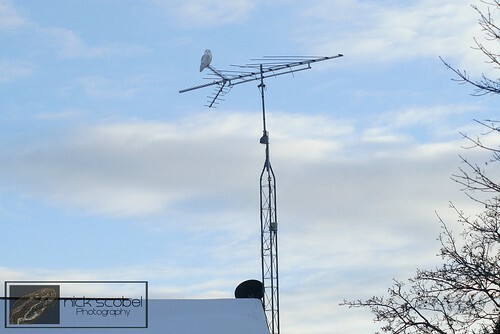 As I was passing one of the few houses in the area, I noticed a large white bird atop the house's old school antenna. 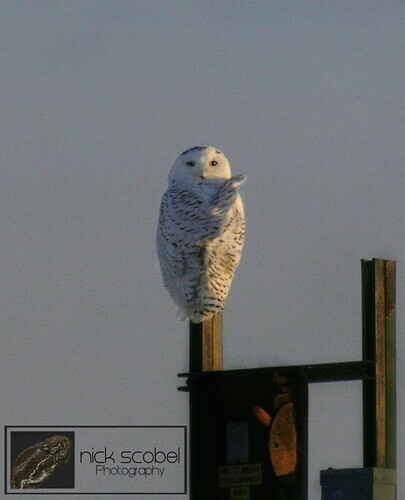 Sure enough, it was a snowy owl. This is one of at least two different owls that has been spotted in this area, the other being a much larger and heavily barred immature female most likely. 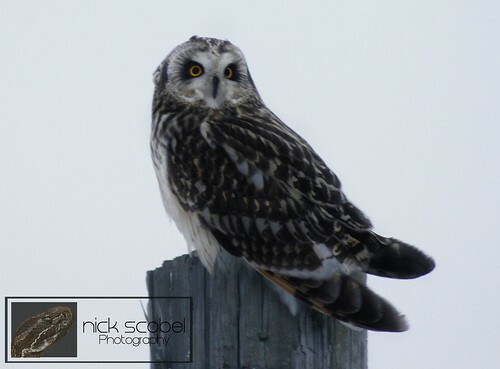 Two other birders had seen the bird as well and we spent a few minutes admiring the owl from the road. After a few minutes the owl decided to fly off over the horizon. 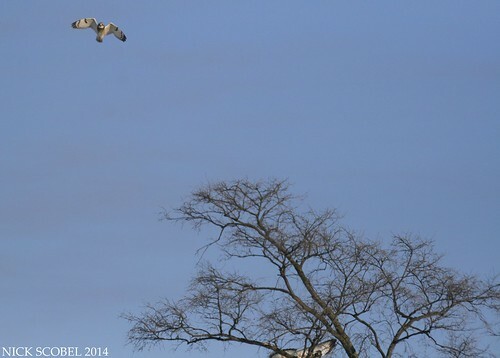 Snowy owls may stick around through the month of February, so if you can, get out and see them while you can! 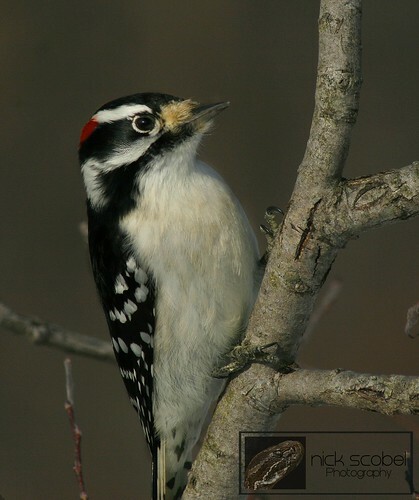 Had some spare time today and was able to convince my herping buddy Chris Boguslawski to come out of winter hibernation for an afternoon of birding. We rendezvoused around two in the afternoon and set off. Conditions were overcast and with some light snow flurries. We quickly tallied a handful of raptors including Red-tailed Hawk, Rough-legged Hawk, American Kestrel, Northern Harrier, and a Merlin. I was hoping to snag a shot of the merlin but it was much too quick for me to get my camera up in time. 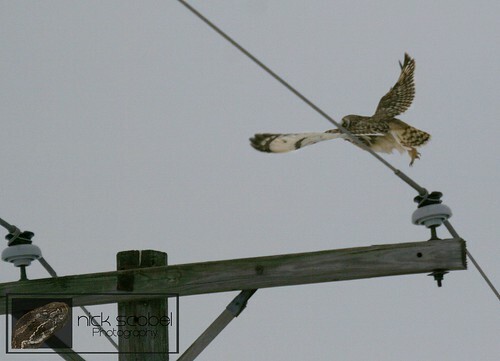 As we were about the leave the area, we spotted a Short-eared Owl perched atop a telephone wire. 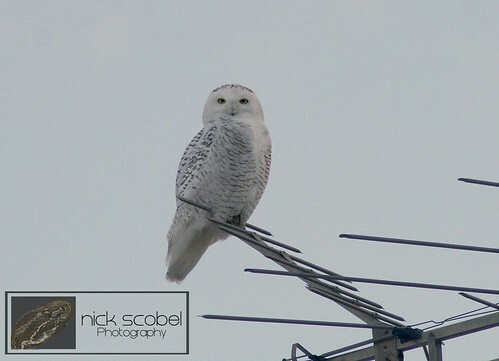 We drove a short distance from our first location to look for snowy owls. We came around a tight corner when I noticed this snowy right along the road, it was quite cooperative for some nice shots from the car before eventually flying off. It was getting late in the day and Chris was hoping to see Short-eared Owl up close, so we headed back to our first stop in the day just before dark. 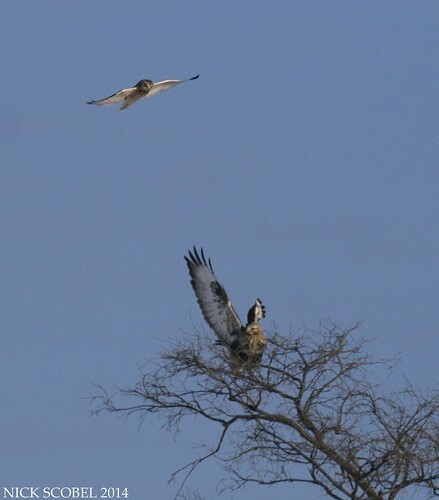 Almost immediately upon our arrival, we noticed two individuals flying along the edges of the field. One ended up perching on a small fencepost and allowed us to get really close for some killer shots. 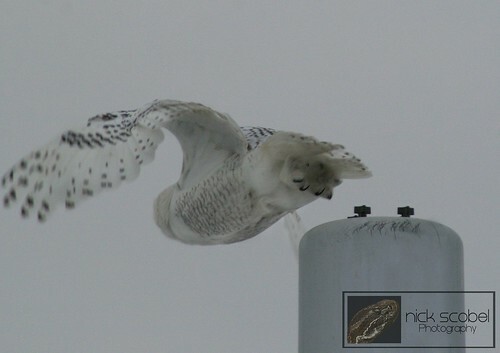 It was awesome to finally get some really nice shots of these owls, particularly the snowy. 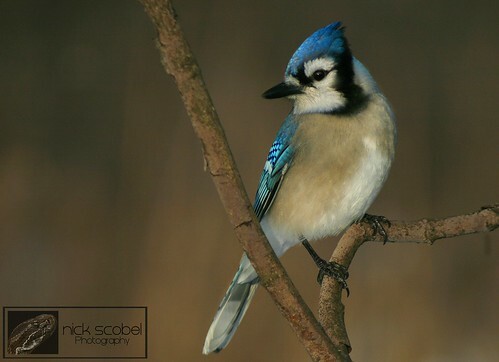 I told Chris he needs to come along with me more often as I have never gotten as close to the birds as I did today. 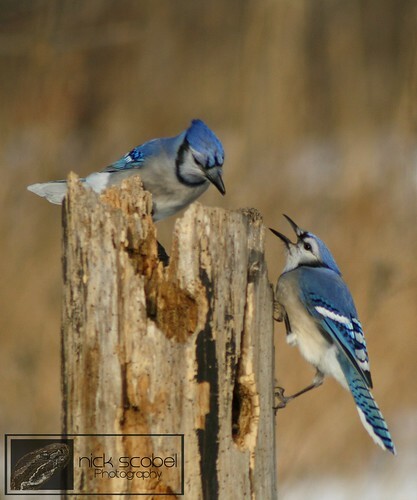 Sunday January 12th brought sunny skies and temperatures in the low 40s, so my dad and I decided to go do some birding at Kensington Metropark. It ended up being a great outing as we got some real nice photos of some common birds that neither of us had great photos of. I figured I'd share a few of the shots. Thanks for the great outing dad! It's been a tumultuous week of weather here as winter storm Ion moved through over the weekend, dropping more than a foot of snow on southeast Michigan. The polar vortex that caused the snow followed the storm brought icy cold air from the arctic, resulting in record low temperatures which included wind chills 30-40 degrees below zero. Eventually the winds chills dissipated and the roads were cleared and I was able to get out and do some birding on my birthday. I started the day off by investigating some recent sightings of Common Redpolls in western Washtenaw County on state land. Lots of small passerines were out, but no redpolls were to be found. I decided to head back to the eastern part of the county to drive some areas in search of a Snowy Owl which had been around Superior Township but hasn't seen for a week or two now. 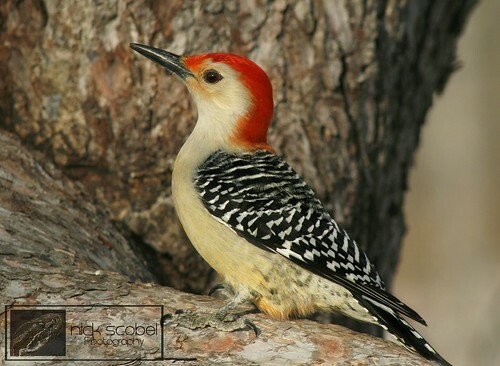 As I turned down a road, I noticed a small bird perched atop a roadside tree. 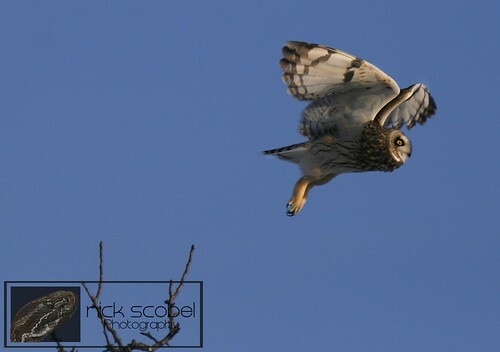 It was a Short-eared Owl, a small owl which inhabits open grasslands and agricultural lands across much of the world. This particular area seems to have a lot of them and they can often be seen soaring low over the corn stubble. The bird blew a few trees down and perched again, so I moved my tripod a little further down the road and snapped a few more shots. Something caught the owl's attention, and it took off rapidly. I was able to snag a shot during takeoff, I'm pretty happy with the result. 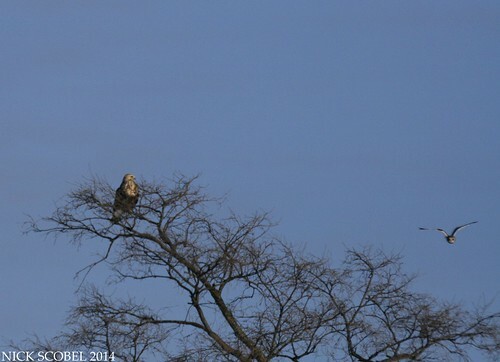 The owl flew down the edge of the road towards a large tree, which happened to have a large raptor perched atop it. 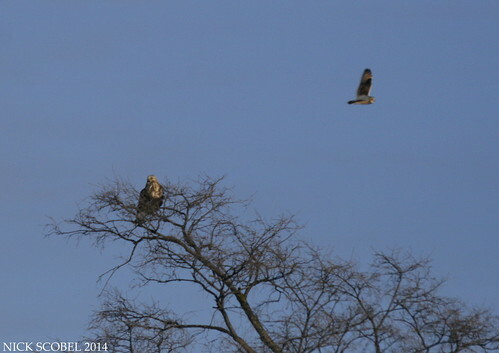 I quickly redirected the scope towards the tree to see that it was a large Rough-legged Hawk (Buteo lagopus) that the owl was making a bee line towards. Over the next few minutes the owl repeatedly swooped at circled the hawk aggressively, trying to flush it from the tree. 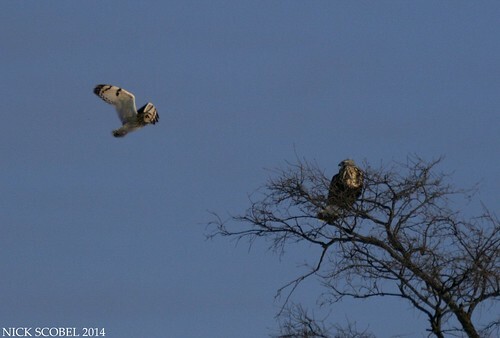 It was pretty cool to watch for a few minutes before the owl finally succeeded in getting rid of the hawk. I drove some of the surrounding areas in hopes of seeing the Snowy that had been seen in the area to no avail. The sun was getting low, so I decided to head out and make one small pit stop. 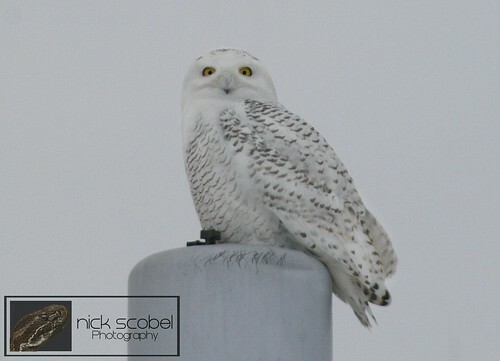 Even in the first 11 days of January, there has been massive numbers of Snowy Owls observed throughout the Great Lakes basin and into the northeast. 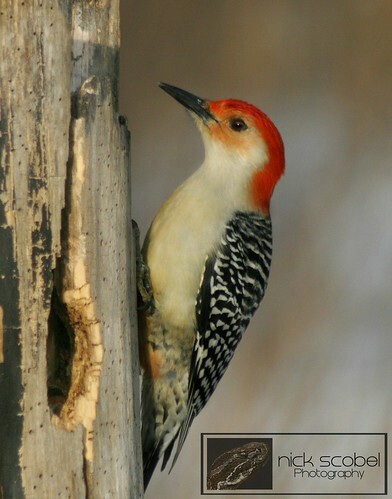 Here's a sighting map for January 2014 via eBird.org. I arrived at my destination just before sunset and did a quick loop of the area. As I came around a corner, I noticed a large white blob sitting atop a small man-made structure. 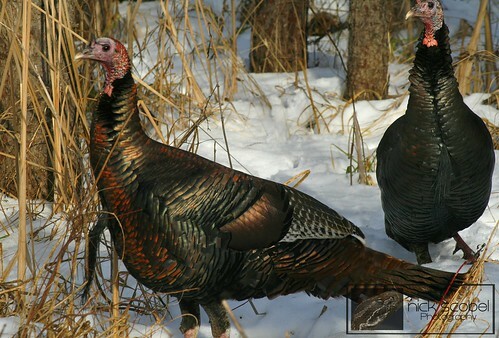 Snowies are truly magnificent birds, standing almost two feet tall with a five foot wingspan. I was able to trudge through knee deep snow to get close to a fence in order to photograph this owl which was in a restricted area about 40 yards away, it was quite tolerant of my presence. 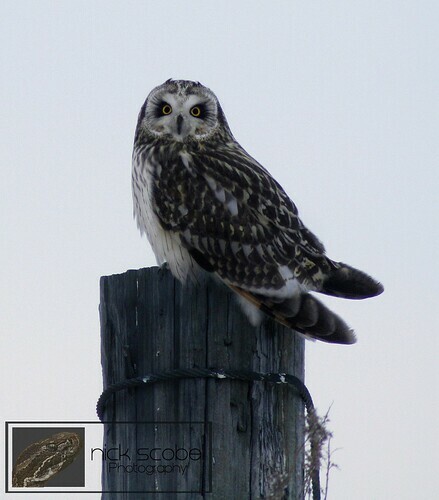 I fired quite a few photos over the course of a few minutes before heading back to the car, the owl never moved. It was an awesome way to spend my birthday and I couldn't be happier with the shots I got.